While we backpacked in Southeast Asia we rarely booked our accommodations in advance. And there were only a few instances when we showed up at a hostel to find out it was fully booked. In this case, just ask for another recommendation and they will gladly help you out. How do you pick where to stay? I had never stayed in a hostel before backpacking Southeast Asia, so the prospect of sleeping in a dorm conjured images of horror movies in my head. Maggie and a host of travel bloggers convinced me that hostels were not only a norm, they could be really fun and social. That being said, every hostel we used was found through a positive review. First, we would check with travel bloggers who had stayed in the area and go for their top recommendations. Second, we would make friends on the road and ask them where they were staying. Just about everyone has a recommendation to share and since most people are traveling alone or in small groups they are happy to pair up and try out a hostel together. In the cases where we found ourselves alone and without a recommendation we would scour Hostel World and Agoda, looking for high ratings and positive reviews for a location central to our destination. Which hostels do we recommend? In Bangkok we stayed in a variety of places but only really liked two. Khaosan Immjai was a hostel a few blocks from Khaosan Road. We liked the clean rooms and good AC. The large dorm was social but very quiet and had great wifi. Lub.D in Siam Square was a bit expensive compared to other accommodations in SEA but so worth it. The rooms are minimalistic but clean and comfy. We though basic accomodations like bathrooms, AC and wifi were exceptional, not to mention the extras they offer like social activities, tours, book share, laundry and food. The location was ideal for navigating the metro system and taxis were readily available outside. Click here for a guide to exploring Bangkok. Nothing compared to the social environment we encountered at Deejai Backpackers in Chiang Mai. There is a pool down the road at Deejai Gardens along with a tree house, hammocks, restaurant and bar. After a morning of exploring, everyone hung out at the pool making friends and plans for the evening. The courtyard and lobby of the hostel were always bustling as well. Spicypai Backpackers was one for the books. An experience in and of itself, this hostel offers three levels of bunk beds in an outdoor dorm room that is reminiscent of a tree house. 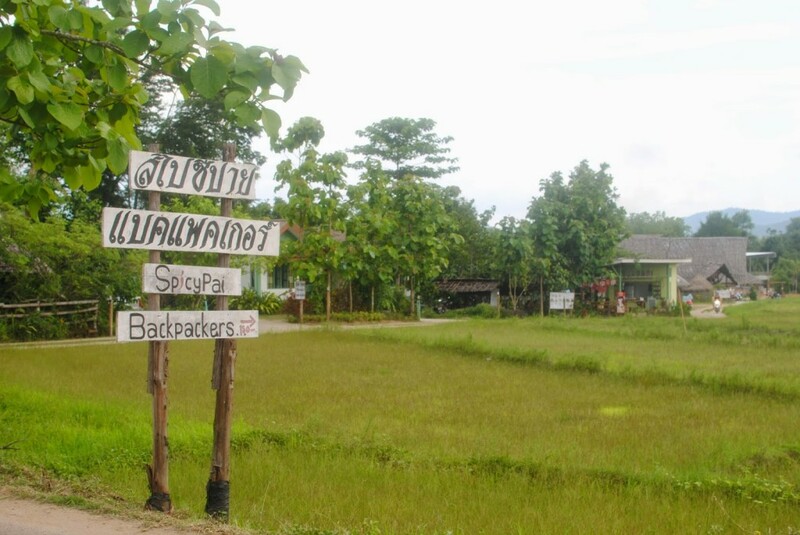 The hostel is on the edge of town but everything is a short walk in Pai. We visited the East Thai islands with a Contiki tour, so we got to experience three luxury hotels. Considering the islands are already fairly expensive anyways, you can expect to spend more on accomodations. In Koh Samui we stayed at the Nora Chaweng Hotel on Chaweng beach. The location was good for accessing bars, restaurants and the beach and the hotel was top notch after two weeks in hostels. In Koh Tao we stayed at the Charm Churee Villa. These little villas were beachside and for a second I almost thought I was on my honeymoon. They even offer a restaurant that sits over the water. In Koh Phangan we stayed at one of my personal favorites, Shiralea Backpackers Resort. They have all the food, drink and fun you could ask for but be careful with the tab system or you might face a hefty bill (like I did) when you check out. At least the delicious breakfasts cooked to order were included with the room. In Siem Reap we stayed at three places and the only one worth mentioning is the Siem Reap Hostel. The privates are pricey but regardless I recommend staying in the mixed dorms. A fun, social atmosphere plus the hostel will coordinate a crack-of-dawn tuk tuk tour to take you to Angkor Wat for the sunrise. We stayed other places that were fine, but not especially great. PHUKET – Options were to stay in an expensive hotel right in Patong Beach or stay in a crap hostel or fancy hotel at one of the neighboring beaches. We went for crap hostel in Karon Beach. It fitted our needs (except for AC haha). KOH PHI PHI – The hostels along the path to the viewpoint are most affordable and offer basic amenities. LUANG PRABANG – Central Backpackers Hostel did the job but wifi was limited. We heard good things about LPQ. VANG VIENG – I can’t remember the name of the place we stayed but it was right next to the tubing shop and looked more like a hotel. It was fairly cheap and pretty nice with a good location. We also heard recommendations for Central Backpackers Hostel here. Book your first accommodation in advance – you will be grateful to have a place to crash after the jetlag and confusion of travel sets in. Ask for recommendations from other backpackers or read up on travel blog. Look for high ratings on booking websites like Hostel World. Check the mattress and sheets for signs of bed bugs. I know, yuck, but you’ll be glad you did if you run into a case of bed bugs like we did in one hostel in Siem Reap. You will be immensely grateful for amenities like wifi and AC. Book a bed in the dorms to meet other travelers but treat yourself to a private every once and awhile. Have a favorite hostel that I missed? I love new recommendations so please share yours in the comments below! Check out this post if you are looking for a packing guide. For tips on budgeting your trip read this. And you can even take a look at my suggested itinerary. Need help planning your own trip? Follow these 5 easy steps for building a travel itinerary.